The German High Seas Fleet, venturing forth for the first time from the obscurity of its harbor base at Wilhelmshaven, where it had lain inactive ever since the outbreak of the War, sought out and gave battle to the British Grand Fleet in the eastern waters of the North Sea, off the coast of Jutland, on May 31, 1916. Beginning with the chance encounter and running fight between advance cruiser squadrons on scout duty off the Skagger Rack, the battle expanded gradually into a general engagement of the two most formidable fleets afloat, with 270 ships of all classes participating in what is adjudged to have been the greatest naval conflict of all time, and the intensity of which is attested in the recorded loss of twenty-five warships and 10,000 lives. Though indecisive in actual tactical result, in that neither fleet could justly claim to have vanquished the other or to have realized its full objective, yet if the comparative conduct of the two fleets in battle be justly appraised, estimating at their true value the German turning maneuvers which so mystified and even terrified the British High Admiral, and keeping in mind the superior German marksmanship, it must be conceded that in this first real duel of the dreadnoughts the German contender approached the closer to the verge of victory. At grips with the mightiest armada in existence, whose superiority in metal was as two to one and whose excelling speed of ships gave it additional advantage, the inferior German fleet none the less outmaneuvered and outfought the mismanaged British fleet, inflicting upon it losses both in ships and in men approximately twice as severe as those she herself sustained, and at length, when darkness had closed on the scene, inspiring the British Admiral with so vast a fear for the safety of his capital ships as to cause him abruptly to break off the battle, and withdraw with all his super dreadnoughts some eighty miles to the south, abandoning his scattered cruiser squadrons to their own resources and thus enabling the German fleet to steal back unmolested to its base. Let us first visualize the setting for this great battle. The ships of the British Grand Fleet, in pursuance of the general policy of periodical sweeps through the North Sea, had left their safeguarded base off the east coast of Scotland, on May 30, 1916, in two divisions. The lesser division, consisting of six battle cruisers, under Admiral Beatty, supported by four dreadnoughts, under Admiral Evan- Thomas, was steaming southward some seventy miles in advance of the main body of the British Fleet, commanded by Admiral Jellicoe, which comprised a squadron of three battle cruisers under Rear Admiral Hood, a division of four armored cruisers under Rear Admiral Arbuthnot, 24 powerful dreadnoughts in three squadrons, commanded by Vice-Admirals Burney, Jerram, and Sturdee, together with 25 light cruisers and 78 destroyers — 144 vessels with a fleet speed of 20 knots. 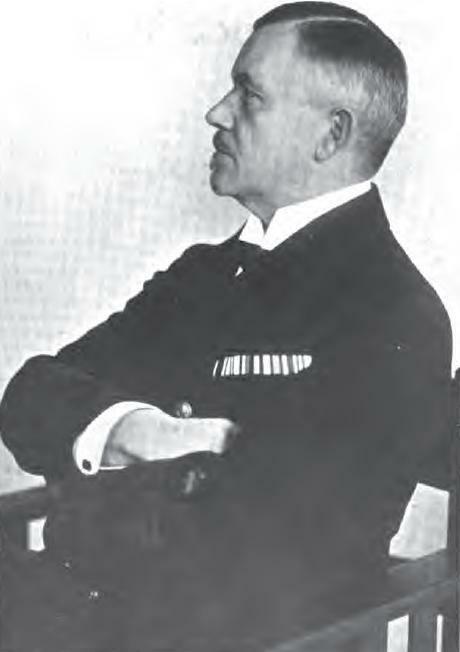 The German Admiral, Von Scheer, whose armada consisted of 22 dreadnoughts, 16 cruisers, and 88 destroyers, with a fleet speed of only 17 knots, had conceived the plan of leading the lesser division of the British Fleet into an ambush where it might be destroyed by the main body of the German Fleet. Pursuant to this plan, a squadron of five fleet cruisers, under Admiral Hipper, acting as a decoy, proceeded northward along the coast of Denmark, with the main division of the German Fleet trailing 25 miles behind. Admiral Beatty's lesser division of the British Fleet, after proceeding south as far as the 56th parallel, had turned northward according to orders. The division was no longer intact, a distance of six miles now separating Beatty's six fast cruisers from Evan-Thomas' four slower battleships. 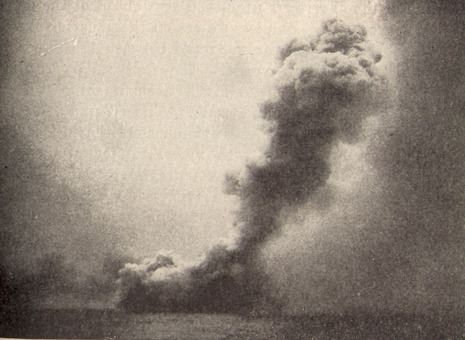 At 2.20 p. m. on May-31st, the smoke of the German ships was detected. Beatty at once shaped his course to the southeast, hoping to cut off the enemy from his retreat along the Jutland coast, at the same time notifying Admiral Jellicoe of the presence of the German ships. 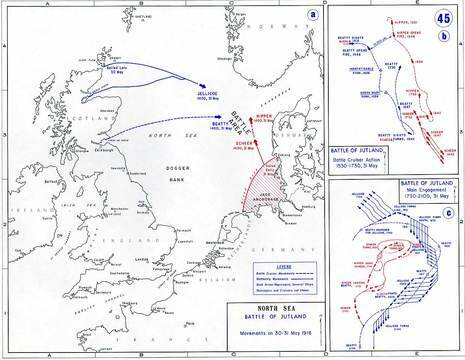 The German decoy squadron also turned south, intending to lead the British into the trap prepared for them. At 3.48 the action commenced at a range of ten miles, both sides opening fire simultaneously. Evan-Thomas' dreadnoughts now joined in the fight, firing from a range of twelve miles. Though the British ships were the speedier and their guns by far outranged those of the enemy, still it was the British that suffered most in this running fight. Within twenty minutes the British cruisers Indefatigable and Queen Mary were sunk with all their crews ; and the British destroyers Nestor and Nomad were also destroyed. Suddenly, at 4.40 p. m., the German High Seas Fleet appeared from the northeast in three divisions, forming a junction with von Hipper's decoy squadron. Realizing now that he had been led into a trap, Admiral Beatty swung his four cruisers around and started north at full speed, leaving Evan- Thomas' four dreadnoughts to bear the brunt of the action with the German Fleet. Beatty hoped to turn the tables on the enemy by leading the Germans into the jaws of Admiral Jellicoe's Grand Fleet, which was steaming south at terrific speed. A running fight ensued for two hours as the two fleets proceeded northward. During this stage of the battle the Germans suffered their severest losses. The cruisers Lutzon and Pommerm were sunk; and the battleships Konig, Seydlitz and Derfflinger were so battered that they could barely keep afloat. 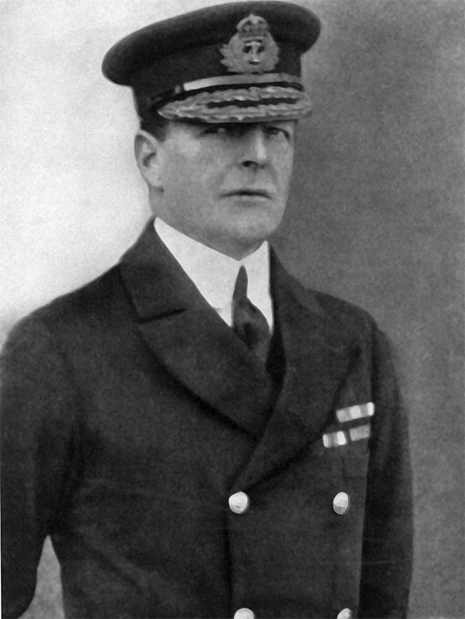 Meantime, Admiral Jellicoe had detached a squadron of three very fast cruisers from his main fleet and sent them, under command of Admiral Hood, to the assistance of Beatty. Hardly had they formed a junction with Beatty's squadron before the Invincible, Hood's flagship, was blown up with appalling suddenness, disappearing in a burst of smoke and flame. A worse fate befell Rear Admiral Arbuthnot's squadron of armored cruisers which arrived at 6.40. 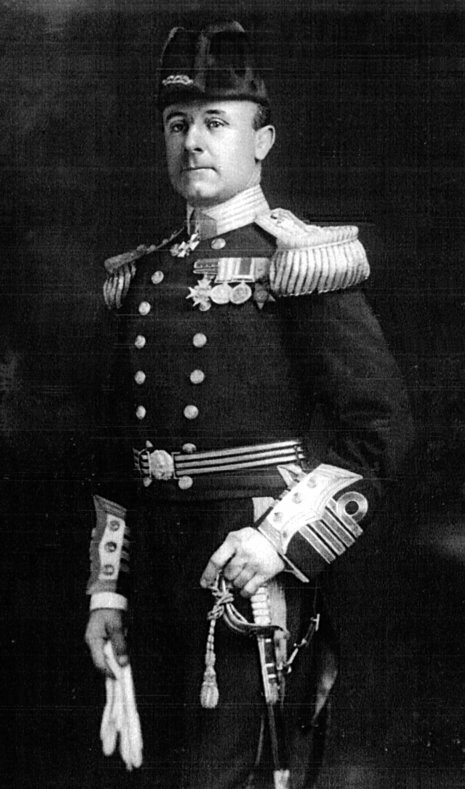 As Admiral Beatty's squadron drew aside to make way for him, Admiral Arbuthnot steered his squadron directly in the path of the German dreadnoughts, receiving the broadside fire of the entire German fleet. Of his four vessels three were sunk with their crews. Admiral Thomas also lost one of his battleships when the Warspite jammed her helm and was taken back to the British base. The British Grand Fleet arrived in six columns shortly after six o'clock. A heavy mist had fallen, obscuring even near objects. Admiral Jellicoe at once deployed to the east, with the double purpose of avoiding the enemy's torpedo boats and of cutting the enemy off from his base. The movement failed of its purpose. The German admiral, after setting up a smoke screen to obscure his movements, launched a torpedo attack which took a heavy toll. A terrific battle of destroyers ensued in the fog, resulting in the sinking of thirteen vessels, of which eight were British and five German destroyers. 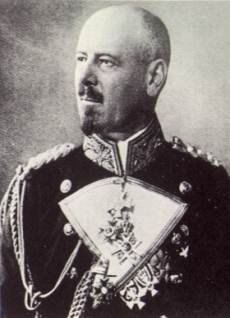 The German Admiral, by adroit maneuvers, kept his capital ships constantly out of reach of the superior British Fleet. Failing to find the German Fleet, and fearing that his own dreadnoughts were menaced by the German destroyers, Admiral Jellicoe at 9 p. m. withdrew from the battle, steaming 80 miles to the south, opening a path for the escape of the German fleet. The British losses in the battle were fourteen vessels, including six capital ships with a tonnage of 111,980, and 6600 casualties. The Germans lost eleven vessels, with a tonnage of 60,180, and their casualties were 3,076. First Round of the Great Fight: 2.30 to 4.38 P.M.
Beatty and Hipper with their Battle Cruisers. At noon on the fateful 31st the Grand Fleet turned north and the German Fleet turned south, each having come to the end of its "drive," and neither knowing that the other one was there. The weather had been very warm and fine; but the North Sea mists had risen in time to veil the fleets from Zeppelins and other aircraft. 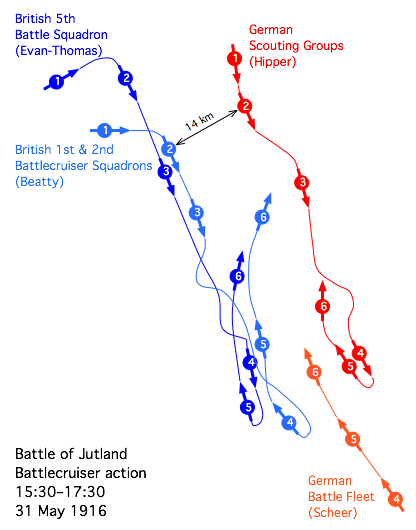 Jellicoe's Battle Fleet was going north within a hundred miles of southern Norway, and von Scheer's Battle Fleet was going south within a hundred miles of the Jutland coast of Denmark, when the two Battle Cruiser Fleets under Beatty and von Hipper suddenly saw each other's smoke, half way between Jellicoe and Scheer, and a hundred miles west of the Skager Rack. Jellicoe and Scheer were then more than a hundred miles apart. But the Galatea's wireless report to Beatty, that there was smoke to the eastward, was caught by the wireless receivers aboard the Iron Duke, Jellicoe's flagship; whereupon Jellicoe ordered steam to be raised for full speed. Beatty at once turned east and made straight for Hipper, to cut him off from his base, force him to fight, and lure Scheer back to save him. This would give Jellicoe time to come up and get in the knock-out blow for which he prepared by ordering the Battle Fleet to clear for action at 3.10. At 3.30 a British seaplane, sent up by Beatty, and flying within two miles of the nearest German craft, reported five battle cruisers steaming south. At the same moment Jellicoe thrilled his own command by signalling that a battle was expected. Hipper was hurrying to join Scheer's battle fleet, which now was racing north as Jellicoe's was racing south. Beatty then formed his six battle cruisers in line-ahead ("follow-my-leader") while his four fast Queen Elisabeth battleships followed as hard as they could. He thus had ten dreadnoughts to fight Hipper's five. But he and Hipper were racing south toward Scheer and away from Jellicoe. Yet that could not be helped. Hipper must not be allowed to escape; and Scheer must first be found and then lured on toward Jellicoe. At twelve minutes to four both sides began firing at a range of eight miles and a speed of nearly thirty (land) miles an hour. Jutland was a gunner's battle, just as the naval experts had foretold; though torpedoes played their part. It was much too fast and furious for submarines; and the thickening mist made aircraft useless. Hipper's five ships hit hard at Beatty's six; and one big German shell reached the vitals of the Indefatigable, which blew up like a mine. There was a shattering crash, an enormous spurt of flame, a horrid "flurry" on the water; and ship and crew went down. That left five all. But, after the battle cruisers had been at it for twenty minutes, the four Queen Elizabeths (that is, battleships of the same kind as the "Q.E.") began heaving shells from eleven miles astern. Ten minutes later the central German dreadnought turned out of line a mass of seething fire. But, after five minutes more, the magnificent Queen Mary, Beatty's champion shooting battle cruiser, was simply torn in two by the explosion of her magazine. This left four all in battle cruisers, with the four fast British battleships straining their last turn of speed to come up. Meanwhile fifteen German and twelve British destroyers charged out together to try their torpedoes, met in the middle, and had a fierce fight. Two Germans went down; but the British formation was broken, and only three closed the German battle cruisers, which received them with a perfect hurricane of shells from their quick-firing guns, sinking one, disabling another, and forcing the third to retire. Commander Bingham, who won the V.C. by leading this skilful and gallant attack, had his destroyer, the Nestor, sunk under him. But he was saved, as if by a miracle, and taken prisoner aboard a German man-of-war. on towards Jellicoe: 4.38 to 5.50 P.M.
Commodore Goodenough's splendid light cruisers went scouting ahead till they met Scheer racing north. Then they turned north themselves, under a tremendous outburst of fire, to rejoin Beatty, who now, changing from pursuer to pursued, also turned north to join Jellicoe. The Germans, with their twenty-two dreadnoughts, now hoped Der Tag had really come for Beatty's eight. But Beatty hit hard and drove a German battle cruiser out of the line very badly mauled. Shortly afterwards the destroyer Moresby fired a torpedo which hit a German battleship. There was a tremendous burst of steam and smoke; and, when this had cleared off, the German was seen to be on fire. But Beatty's strong point was speed. His battle cruisers and four fast Queen Elizabeth battleships could do a good bit more than the slowest Germans; and as the Germans now had to keep together, in case Jellicoe came up, their whole line could go no faster than its slowest ship. 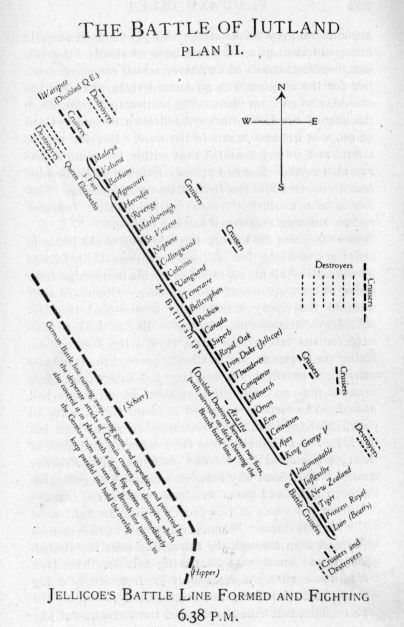 Starting with a lead and putting on a spurt Beatty turned gradually more to the eastward, that is, toward the German line, which then had to turn and keep parallel or else let him cross its T. If you will separate the crosspiece from the upright of a T—for big ships fight some miles apart—you will see quite plainly that ships in a line like the upright of the T have no chance at all against ships in a line like the crosspiece of the T. The crosspiece line can converge all its broadsides on the leading ship of the upright, smash it utterly, and then do the same to the next, and the next. So the Germans, having to keep together and having to keep parallel to Beatty, were gradually forced eastwards, which would give Jellicoe the best chance to come into line against them. Victorious Line of Battle: 5.50 to 6.38 P.M.
For three hours and a half Jellicoe, with his twenty-four dreadnought battleships, had been racing south to reach the scene of action. He had gained at first, when Beatty was going east to find von Hipper. He had lost when Hipper and Beatty were racing south to meet von Scheer. But now the whole battle was coming north to meet him. As the battlefield kept shifting about, and the fortunes of the fight kept changing, he shaped his course accordingly. But he never slackened speed, racing along under every pound of steam the straining ships could carry, thanks to the skill of those quiet heroes of the engine-room, who, seeing nothing of either friend or foe, never know anything of either defeat or victory, life or death, till all is over either with the battle or themselves. As the great Battle Fleet came rushing from the north every eye was strained to catch the first sight of Beatty and the Germans. The thunder of a thousand guns rolled far across that summer sea. It was heard along the coast of Jutland a hundred miles away; and the main body of the Grand Fleet knew The Day had come long before they reached the battlefield. Presently the flashes began sparkling into view; and then the ships themselves loomed up, dimly made out through mist and smoke. Jellicoe did not yet know exactly where the Germans were, and Beatty could not tell what they would do now Jellicoe had come. But Beatty turned sharp east immediately he sighted Jellicoe, and the Germans soon turned too, fearing to have him cross their T while Jellicoe was rounding on them. They wanted to escape, seeing the fight was hopeless. But they could not take the quickest way, that of turning all together—each ship turning right round where she was and making off as hard as she could—because this would have changed the places of the admirals and put the battle cruisers in the rear as well. Nor could they safely turn right back on their course, while keeping the same line-ahead, because some ships would then be masking the fire of others till the whole line had been reversed; and they sorely needed every gun they had. So the only way left was to keep parallel with Beatty till a chance came to turn sharply enough to get away, but not sharply enough to mask any of their own fire. Imagine the whole enormous battlefield as something like a target, with the Germans circling round the bull's-eye, Beatty round the inner, and Jellicoe just coming into the outer. From Beatty's reports and his own observation Jellicoe could not know even that before six. So he sent out his own battle cruiser squadron under Admiral Hood to lengthen Beatty's line and overlap the Germans. Hood then sent one of his light cruisers, the Chester, speeding ahead to scout. But three German light cruisers held her up in a furious fight of twenty minutes. The Chester fought desperately, losing more than half her men, but getting her scout work done in spite of the fearful odds against her. How well she fought may be found out from the story of Jack Cornwell; for he was only one of her many heroes. Ship's boy, first class, and sixteen years of age, Jack Cornwell would have been the youngest V.C. in the world had he lived to wear it. With every man in the gun's crew round him dead or dying, and with the gun-shield shot away, he stood there, under a terrific fire, mortally wounded, with the receivers at his ears, reporting exactly what had happened to everyone except himself, and calmly waiting for orders how to carry on. When the battered Chester told Hood he was too far south-east he turned back north-west till he sighted Beatty coming toward him at full speed. On Beatty's orders he then carried out Jellicoe's plan by turning back so as to lengthen Beatty's line of battle cruisers at the forward end, thus overlapping the Germans. This splendidly skilful and most daring move so alarmed the Germans that they trained every gun they could on him in a furious effort to wipe out the deadly overlap. He led the gallant line, "bringing his squadron into action ahead in a most inspiring manner, worthy of his great naval ancestors." (He was the great-great-grandson of the Lord Hood whom Nelson always called the best of naval officers.) His flagship, the Invincible, hit back with all her might, helped by the ships astern. "Keep it up," called Hood to his gunnery officer, Commander Dannreuther, one of the six survivors, "every shot is hitting them." But the converging fire of a hundred giant guns simply smashed the Invincible from stem to stern. At last a huge shell reached her magazine, and she blew up like a volcano; sheets of flame leaping higher than her masts, boats and loose gear whirling higher still, like leaves in an autumn gale, and then one sickening belch of steamy smoke to tell that all was over. After this Hood's two remaining battle cruisers took station astern of Beatty's four. Meanwhile another light cruiser of Hood's, the Canterbury, was trying to protect three destroyers, led by the Shark, that were fighting German light cruisers and destroyers. Hipper and Scheer were doing their very utmost to keep Beatty and Jellicoe at arm's length till they could complete the German turn round the bull's-eye and make an effort to get off the deadly target altogether. For if Jellicoe could range round the inner, at higher speed and with an overlap, they would certainly be rounded up and crushed to death. The German light cruisers and destroyers therefore attacked the British light craft with the greatest fury, hoping to destroy the screen behind which Jellicoe would form his line of battle in safety from torpedoes. As the Shark charged down at the head of her line she suddenly found two lines of German destroyers charging towards her. Nothing daunted, she went straight on, her pulsing engines making her quiver with the thrilling race for life or death between them. Once abreast of them she fired her guns and torpedoes right and left, sinking two German destroyers, one on each side, and giving the rest as good as she got, till, hit by torpedoes on both sides together, she sank like a stone. Her commander, Loftus Jones, was awarded the second posthumous V.C. for the wonderfully gallant way he fought her till she went down with colours flying. Her last torpedo, when just on the point of being fired, was hit by a German shell and exploded, killing and wounding everybody near. Then another shell took Jones's leg off. But he still fought the one gun left in action, firing its last round as the waters closed above him. About the same time the destroyer Onslow made for a German light cruiser that was trying to torpedo Beatty's flagship, Lion. Hitting the light cruiser with every gun at short range she then passed on to try her own torpedoes on the German battle cruisers, when a big shell scooped out most of her midships above the water-line. Retiring slowly she again met the light cruiser and this time finished her with a torpedo. Finding he had two torpedoes left Commander Tovey then made for the German battle line with the last ounce of steam the Onslow's engines could work off. He fired them both, and probably hit the dreadnought that was seen to reel out of line about three minutes later. The Defender, though herself half wrecked by several hits, then limped up and took the Onslow in tow till one o'clock the next afternoon, when tugs had come to the rescue. The strongest of all the lighter ships that cleared the way for Jellicoe's battle fleet were the armoured cruisers, which are about half way between the light and battle cruisers. Sir Robert Arbuthnot's First Armoured Cruiser Squadron, speeding ahead of Jellicoe, swooped down on the German light cruisers in grand style, sank one, lamed two, and was driving the rest before it, helter-skelter, when, without a moment's warning, the huge hulls of the German battle line loomed out of the mist at almost point-blank range! In his eagerness to make short work of all the German light craft in the way Sir Robert had lost his bearings in the baffling mist and run right in between the two great battle lines. Quick as a flash he fought the German giants with every gun that he could bring to bear while turning back to take his proper station on the flank. But he was doomed and knew it. Yet, even at that fatal moment, his first thought was for the men whom, through no fault of his own, he had led into this appalling death-trap; and besides the order to turn back he signalled the noble apology to all hands under his command: "I beg your pardon." The end came soon. A perfect tornado of gigantic shells had struck his flagship, the Defence, at the very first salvo. She reeled under the terrific shock and had hardly begun to right herself before her sides were smashed in by another. At the third she crumpled up and sank with every soul aboard of her. Her next astern and second, the Black Prince, and the Warrior, managed to crawl away under cover of the mist. 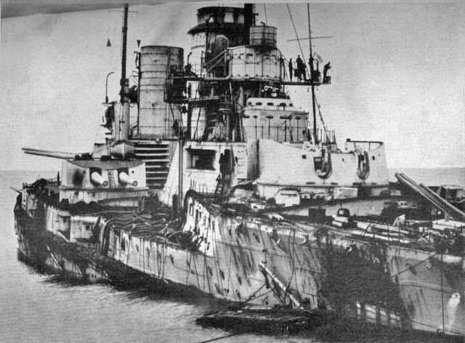 But both went down; though the battered Black Prince survived to be sunk by German battleships during the night. About this time, just after six, the fight was at its very fiercest, especially between the opposing light craft. It was a question of life or death for the Germans to keep the British light craft away and use their own to the utmost while their battle line was turning toward the west in a desperate effort to keep ahead of Jellicoe. This was not cowardice, but a desire to save the German fleet from utter ruin once victory was seen to be impossible. Not all the brave deeds were on one side. How much the Grand Fleet's honour would be dimmed if its opponents had been cowards or if its own commander had failed to give the enemy his due! "The enemy," said Jellicoe in his dispatch, "fought with the gallantry that was expected of him, and showed humanity in rescuing officers and men from the water. I particularly admired the conduct of those on board a disabled German light cruiser which passed down the British line under a heavy fire that was returned by the only gun still left in action." But of course this was well matched by many a vessel on the British side, in a fight so fierce and a turmoil so appalling that only men of iron training and steel nerves could face it. Light craft of all kinds were darting to and fro, attacking, defending, firing guns and torpedoes, smashing and being smashed, sinking and being sunk, and trying to help or hinder the mighty lines of battle whose own gigantic guns flashed and thundered without a moment's pause. As Jellicoe closed in to get the strangle-hold his mighty battle fleet had, in very truth, to go through fire and water: the racing ships, their slashing bows and seething wakes; the pall of smoke, stabbed by ten thousand points of fire, together making the devil's colours—yellow, red, and black; the leaping waterspouts thrown up by shells that missed; the awful crashings when the shells struck home; the vessels reeling under well-aimed, relentless salvoes; the ships on fire beyond the reach of human aid; the weirdness of the mist that veiled these dreadful horrors, or made them ghastlier still, or suddenly brought friend and foe together either to sink or swim; the summer sea torn into the maddest storm by ships and shells; while, through and round the whole of this inferno, there swelled and thundered the stunning roar of such a giant fight as other navies had never seen or even dreamt of. So deafening was this roar, and so absorbing were the changes of the fight, that when a ton-weight shell swept overboard every atom of the bridge aboard the leading ship of a flotilla—with compass, chart-house, engine-room-telegraph, steering wheel, and every soul on duty there—the men on "monkey's island," just above the bridge, never knew their ship was even hit till she began to run amuck and rammed another British vessel! This was the battle into which Jellicoe had to fit his own vast force of twenty-four dreadnoughts without checking Beatty, without letting the Germans get a clear run home, and without risking the loss of his own best battleships by making one false move. At four minutes to six Jellicoe sighted Beatty. Five minutes later he asked him for the position of the German line. Nine minutes later he asked again. The smoke and mist were so bad at first that it was not till 6.14 that Beatty could say exactly. At 6.16—just two minutes later—Jellicoe's plan was made and his orders had gone out. There, in the conning tower of the Iron Duke, within those two short minutes, he had calmly thought out every chance and change and way of going into action under conditions which could not have been worse for him or better for the Germans. His twenty-four battleships were in six divisions, side by side, each division in line ahead, and all numbered off from port (left) to starboard (right). The leading ship of the 1st, or port wing, division was the King George V. The leading ship of the 6th, or starboard wing division, was the Marlborough. His own flagship, the Iron Duke, led the 3rd division. The supreme moment had now arrived. There was not a second to lose; for the fleets were covering more miles in an hour than armies do in a whole day. But if he formed line on the starboard wing, the nearer to the Germans, he would have had to wait some time till Beatty's battle cruisers had drawn clear. During this dangerous pause, while his own fire would have to be blanketed by Beatty, the German battle line would have had a double British target to make hits on, and the German light craft would have had the best chance of catching him with their torpedoes while he was in the act of forming line. Moreover, the German line might have concentrated on the starboard wing before the port had taken station, and might have overlapped the whole line afterwards. Jellicoe therefore decided to form on the port wing, giving his own line the chances of the overlap, and then fit in astern of Beatty. But, being ready by the time Beatty's battle cruisers were drawing ahead, he fitted in his own line between these and the four fast Queen Elizabeths that formed the rear of Beatty's line. Thus, in the very worst of this gigantic battle, the twelve miles of the final British line were formed. Three battle cruisers had been sunk: the Indefatigable, Invincible, and Queen Mary. One fast battleship, the Warspite, had fallen astern with a damaged helm. But six battle cruisers still led the van. Twenty-four fresh battleships followed. And three fast Queen Elizabeths brought up the rear. Jellicoe then personally commanded a single line-ahead twelve miles long and dreadnoughts all. Every part of every change was made as perfectly as if at the King's review. You could not have made the line straighter with a ruler, nor placed it better if the Germans had been standing still. For as Beatty's overlap kept turning them from north to east and east to south, to save their T from being crossed, Jellicoe's whole line had now worked to the landward side of them, that is, between them and their great home base on the German coast. Fourth Round: Jellicoe Victorious: 6.50 to 9.00 P.M. Driven to desperation by being overlapped and turned away from Germany, the Germans made a supreme effort to escape toward the south-west, thus completing their circle round the bull's-eye, as Jellicoe began to round them up from the inner. Their destroyers spouted forth an immense grey smoke screen; the mist helped them to hide; and the sun went into a bank of clouds. As they ran they fired shoals of torpedoes, which are much deadlier for the chasers, who go toward them, than for the chased, who go from them. The battleship Marlborough, flagship of Sir Cecil Burney, Jellicoe's Second-in-Command, was hit and began to list over. But she was so strong and so well handled that within ten minutes she was at it again. She had already fought two battleships and a cruiser while the British line was forming. Now she caught another German battleship with fourteen salvoes running and drove her out of line. The Germans fired every torpedo they could bring to bear; and nothing but Jellicoe's supreme skill, backed by the skill of all his captains, saved his battleships from losing at least a third of their number. Observers aloft watched the enemy manoeuvring to fire and then reported to Jellicoe, who, keeping in line as long as possible for the sake of the guns, turned the fleet end-on, away from Scheer, just in time to prevent the torpedoes catching it broadside on, and then left each captain free to work his own ship till that shoal of torpedoes had passed. The torpedoes arrived at about thirty miles an hour, shoals of them together, and showing no sign but the little line of bubbles from their screws. But most of them were spotted and not one got home. The Revenge worked her perilous way between a couple, one just missing her rudder and the other almost grazing her bows. At 8.20, somewhere behind the mist which then veiled the German line, there was a volcanic roar that shook every keel for miles around. Scheer was losing heavily, running for his life, and doing his best to hold Jellicoe back by desperate light craft attacks with hundreds of torpedoes. But Jellicoe countered this with his own light craft, which sank four enemy destroyers before the night closed in. 9.00 P.M. 31st of May, to 4 P.M. 1st of June, 1916. Jellicoe now had another hard question to answer, a question, indeed, to which there could not be a perfect answer. The Germans were broken and flying. But they still had many light craft with hundreds of torpedoes; they were not far from home and near a swarm of their best submarines; and their whole coast was full of mines for many miles off shore, while the shore itself and the string of off-shore islands were defended by a regular chain of gigantic forts armed with enormous guns. Following them home was therefore out of the question altogether; for you can sink a fleet, while you can't sink a coast. But even trying to run them down at night was out of the question too; for their strongest point was night fighting, which is much fuller of risks and chances than day battles are. Besides, there was the chance of missing them and losing the best position between them and their base. So Jellicoe and Beatty separated again and steamed, parallel to each other, south-south-east to within a hundred miles of the German coast. They could not possibly cover more than a quarter of the whole way into the Danish and German coasts; and so most of the Germans managed to slip in behind them, round by the north. The night fighting was done by the light craft; and it was here that Jellicoe had so much need of Tyrwhitt's flotillas from Harwich. Harwich was very handy to the battlefield and Tyrwhitt's light craft were as keen and ready as any one could be. But the Government were afraid to let them go, for fear lest some Germans might raid the English coast. There was very little chance of a raid at all. It could not have been a bad one in any case. No mere raid can change the course of a war. The best way to stop raids is to win the war by destroying the enemy's means of destroying you. The best way to do this is to smash his main force wherever it happens to be. And the best way to smash it is to throw all your own forces against it once you get a hold on it. But people who are scared in one place will not think about the war as a whole, though that is the way to save these very people as well as all the rest. So they ask for some defence they can actually see. It was much the same as in the days of the Spanish Armada. Drake and Jellicoe wanted to do the right thing. But Queen Elizabeth's Council and King George's Government wanted to humour the people concerned. The only comfort is that, with all our faults, we of the British Empire make fewer naval mistakes than other people do. The light craft that did reach that famous battlefield could not have done more to guard the British battle lines and harass the flying Germans. There was many a weird sight as scurrying cruisers and destroyers suddenly showed up, ominously black, against the ghastly whiteness of the searchlit sea. Hunters and hunted raced, turned, and twisted without a moment's pause. "We couldn't tell what was happening," said the commander of a dashing destroyer. "Every now and then out of the silence would come Bang! bang!! boom!!! as hard as it could for ten minutes on end. The flash of the guns lit up the whole sky for miles and miles, and the noise was far more penetrating than by day. Then you would see a great burst of flame from some poor devil, as the searchlights switched on and off, and then perfect silence once more." Next Day. Dawn comes early on the 1st of June at 55 degrees North. But the mist veiled everything more than three or four miles off. At 3.30 A.M. a huge Zeppelin flew across the British battle line, wirelessing down to any Germans still to the westward the best way to get home. By nine the light craft had all come in after scouring the sea for Germans. At a quarter past one it was plain that not a German ship remained to challenge the Grand Fleet. So Jellicoe made for his base; took in fuel, stores, and ammunition; and at half-past nine next evening was ready for another battle. The News. Very different was the plight of the flying Germans, who lost more ships than the British (eighteen, and perhaps six more, to fourteen British) and who left the field for good and all. But Germany sorely needed a victory just then. So the Kaiser proclaimed one, and all the German papers echoed his words. The German lie got two days start of the British truth, and was eagerly repeated by every one who hated the British or Allies. On the other hand, the British Government simply said that there had been a battle and that fourteen British ships were down. They shrank from proclaiming the victory, because they thought that most people, knowing nothing of modern naval war and making no allowance for the weather and other German advantages, would not believe in a victory which let any of the German ships escape. And so the lie went round the world much faster than the truth. Yet it was only believed by those who wanted to believe it. Even some Italian mountaineers who had never seen a ship said, "That's a lie," when Italian traitors told them the Grand Fleet had been sunk. After waiting a month to examine the whole case thoroughly the Board of Admiralty, which has always been most sparing in its praise, wrote Jellicoe an official letter, saying that "the Grand Fleet has known both how to study the new problems and how to turn the knowledge to account. The expectations of the country were high. They have been well fulfilled. My Lords (the Members of the Board) desire to convey to you their full approval of your proceedings in this action." What Jellicoe himself thought of those who fought so well under his inspiring leadership cannot be said better than in his own words. "The conduct of officers and men throughout the day and night actions was entirely beyond praise. No words of mine could do them justice. On all sides it is reported to me that the glorious traditions of the past were worthily upheld. Officers and men were cool and determined, with a cheeriness that would have carried them through anything. The heroism of the wounded was the admiration of all. I cannot express the pride with which the spirit of the Grand Fleet filled me." Results. Jutland taught the German Navy what every one should have known before: that whenever tyrants have tried to lord it over all the world they have always had to reckon with the British Navy first, and that this Navy has never failed to lay them low. More things were wrought by Jutland than the British Empire thinks, and more, far more, than other people, for lack of knowledge, can imagine. There was a regular, unbreakable chain of cause and effect, and Jutland was the central link. To conquer their bully's "place in the sun" of the white man's empire overseas the Germans built their Navy. But the Grand Fleet blockaded it so well that the Germans clamoured for a fight to wipe the British off the sea and to let the German merchant ships get out. Jutland settled that. From Jutland on to the end of the war the German bluejackets could never again be led against the British on the surface of the sea. So the murderous German submarine campaign was tried instead. This forced even the American Peace Party to change their minds and save their country's honour by joining the War Party in armed defence both of American rights and of the freedom of the world. After another two years the Germans failed under water as they had upon the surface; and when, in wild despair, the Kaiser ordered the whole of his High Sea Fleet to try another fight, the final mutiny began. This broke out at 5 A.M. on the 3rd of November, 1918, eight days before the Armistice. It was not the German Army, nor yet the German people, that began the Revolution, but the German Fleet, which knew that a second Jutland could only mean the death of every German there. In its own turn the Revolution brought on the great surrender, a thing unheard-of in the story of the sea. Thus, like the immortal Battle of the Marne on land, Jutland was not only itself a mighty feat of arms but one on which the whole war turned.